In the year 1961, a Neurosurgical Unit was established in the Department of Surgery with Dr PN Tandon (1961-1965) as Professor After that, distinguished faculty Dr VS Dave (1967-1989), Dr GB Newton (1965-1993), Dr DK Chhabra (1974-86) and Dr VP Singh (1990-1993) expanded and guided the development of this specialty. In 1994, the Neurosurgical Unit was upgraded to a separate Department of Neurosurgery with Dr Mazhar Husain (1986-2008) as Head of Department The department was further strengthened when Dr Ravi Dev (1998 - 2009), Dr BK Ojha (2003), Dr Anil Chandra (2003), Dr Sunil Kumar Singh (2009) and Dr Chhitij Srivastava (2010) joined the department Recently Dr Somil Jaiswal (2015) , Dr Manish Jaiswal (2015), Dr Ankur Bajaj and Dr Awadhesh Yadav have joined the department Four vacant posts of faculty will be filled soon At present department is headed by Dr BK Ojha. The M Ch Neurosurgery program started in the department in the year 1971 with 2 M Ch seats per year In 1996, the number of M Ch seats were increased to 3 per year and from 2011 onwards it has been increased to 4 per year For admission to these four M Ch seats a national level entrance examination is held once a year Till date, more than 100 students have completed M Ch Neurosurgery from this department The list of all the alumni of the department is provided at the end of this page. 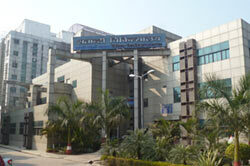 Recently the department has been shifted to a new building of Shatabdi Hospital Phase - 2 on 5th floor The office complex and the general wards (42 beds) and private wards (7 rooms, 14 beds) are on same floor The 4 state of the art operation theaters are on 1st floor in the adjoining Shatabdi phase 1 building The department has 35 seat capacity Auditorium with Audio Visual Facility, Departmental Library, Neurophysiotherapy Unit and a staff strength of approximately 150 to run the department.